MANILA, Philippines - (Updated May 29) Out of 9,645 total examinees, the list of passers for May 2017 Certified Public Accountant or CPA board exam was officially released by the Professional Regulation Commission (PRC) and the Board of Accountancy (BoA) today, Monday, May 29 or in 5 working days after the exam. The full results together with the list of topnotchers (top 10), top performing schools and performance of schools are now posted on this page. 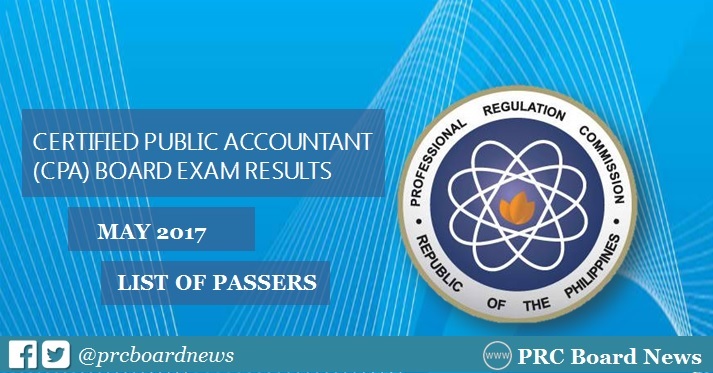 UPDATE: As announced, 3,389 out of 9,645 passed the CPA board exam. PRC-BoA administered the CPA board exam on May 14, 15, 21 and 22 in cities of Manila, Baguio, Cagayan de Oro, Cebu, Davao, Iloilo and Legaspi. The Board of Accountancy is composed of Joel L. Tan-Torres, Chairman; Eliseo A. Aurellado, Gerard B. Sanvictores, Gloria T. Baysa, Concordio S. Quisaot, Samuel B. Padilla and Arlyn S. Villanueva, Members. The 4-day exam covered the following subjects: taxation, regulatory framework for business transactions, auditing, financial accounting and reporting, management advisory services and advanced financial accounting and reporting. Based from PRC Resolution No. 2016-1019, which deals with the schedule of licensure examinations for year 2017, the target release date of May 2017 CPA board exam results is on Monday, May 29 or in 5 working days after the exam. In the same period last year, results were released in 5 working days after the exam. A total of 2,967 out of 6,925 (42.84%) successfully hurdled the series of tests. PRC Board News will update this page immediately for the full results once released online. Bookmark this page for quick reference.